This is why the Genie team has mobilised its resources to develop a range of new telehandlers, the compact Genie® GTH™-2506, the high reach Genie® GTH™-4014 and the Genie® GTH™-4018. “Each model offers the high quality and productivity that customers expect from Genie equipment to support their needs in the construction, waste handling, recycling, industrial and logistics sectors,” said Mike Randle, Terex Aerial Work Platforms Australia, Engineering Manager. To meet the needs of its customers, Genie has left no stone unturned with its testing. The Genie GTH-2506, Genie GTH-4014 and the Genie GTH-4018 have undergone stringent testing, day after day for hundreds of hours - the equivalent of 10 years’ operation in the jobsite environment. “Today, the result is a range of completely redesigned machines featuring updated engines, enhanced capabilities, improved serviceability, more interchangeable components and accessories, and enhanced styling,” said Randle. From the Compact Genie GTH-2506 to the High Reach Genie GTH-4014 and Genie GTH-4018, these telehandlers have been revised to combine: - Fully integrated load management system featuring seven inch colour display with dynamic load chart with reversing camera and optional forward and side cameras. - New capabilities: increased lifting heights, improved load lifting performance, increased manoeuvrability and enhanced drivability over rough terrain. - New serviceability: a series of innovations that make service and maintenance easier. - New commonalities: more interchangeable components and accessories across the GTH™ telehandler range. - New livery: the rugged new generation Genie look, to stay looking smarter for longer. - New emissions standards: new Stage IIIB engines. Providing a lifting height of up to 5.79 m (19 ft), a maximum lifting capacity of 2,500 kg (5,511 lbs) and a lifting capacity of 2,000 kg (4,409 lbs) at maximum height, the Genie GTH-2506 compact telehandler combines exceptional capabilities with the benefits of a small footprint. “Thanks to its compact dimensions, this machine is particularly well-suited to perform a wide range of indoor and outdoor construction, renovation, masonry, landscaping and industrial tasks,” said Randle. Among its multiple new design features, the axles of the Genie GTH-2506 are notably equipped with double brake discs to combine the advantages of increased braking power with the durability required to operate for long hours in rough jobsite conditions. Offering lifting heights of up to 13.57 m (44 ft 6 in) and 17.61 m (57 ft), a maximum lifting capacity of 4,000 kg (8,818 lbs) and a lifting capacity of 3,000 kg (6,614 lbs) and 2,000 kg (4,409 lbs) at maximum height, the Genie GTH-4014 and Genie GTH-4018 high reach telehandlers provide increased lifting performance on outriggers. The hydrostatic transmission and the new gearbox offer the benefits of high torque and high traction speeds. On the jobsite, their long reach, class-leading outside turning radius, overall machine width and excellent drivability, provide operators the ability to work more productively when performing construction tasks up to five or six floors high, or tasks such as masonry in congested and confined spaces. 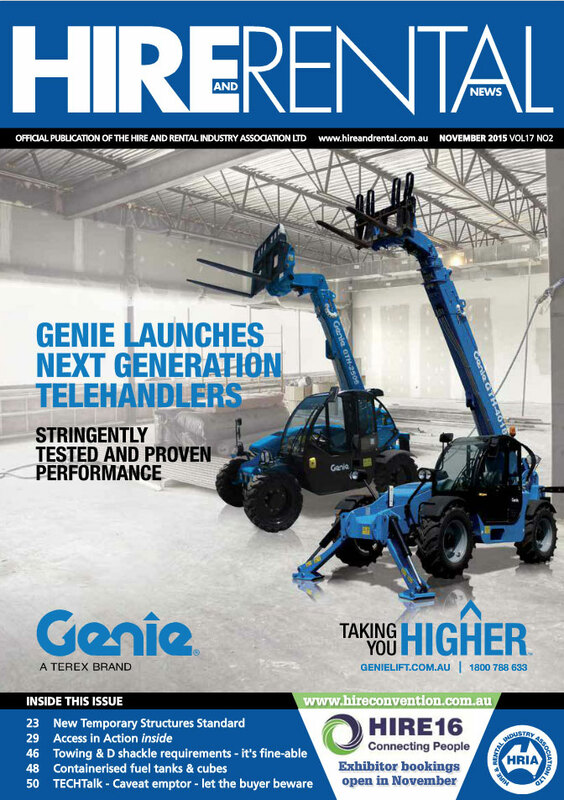 The new Genie telehandler series combines productivity with operator comfort, according to Randle. The cab has been redesigned to include optional and standard features including an air suspension operator seat, improved joystick ergonomics, a tinted top view front window, a large glove box and manual holder inside the door, plus a repositioned air conditioning duct to optimise operator comfort. New control features include an electrically controlled parking brake, operated by an intuitive switch on the dashboard (instead of the previous manual hydraulic system under the seat) for increased braking efficiency. Focusing on jobsite safety, excellent visibility from inside the cab provides operators the wide field of vision they need. As part of its focus on improvement, the Genie team is continuously exploring creative new ways to increase return on investment and reduce cost of ownership. “Based on feedback from customers, we have introduced several small yet innovative solutions to the GTH telehandler series that help reduce costs every day,” said Randle. To this effect, the machines now offer solutions to help minimise damage, such as rubber or steel mudguards, a toughened spring back and folding rear view mirror, and tough steel protected front and rear lights. The Genie brand is known for products that are service-friendly, and these telehandlers are no different. “Combining energy efficiency with ease of operation, all models notably include innovative serviceability features that make maintenance and troubleshooting faster and easier,” said Randle. The valve bank, the fuel tank, the radiator, filters and greasing points are all positioned within easy reach. Hydraulic boom greasing points are also simple to access. Even the engine covers are designed to open at just the right angle for comfortable access during inspections and maintenance. The use of common components and accessories are a winning solution for construction professionals, operators, rental companies and manufactures alike. In addition to reducing storage costs, this approach is also beneficial in terms of operator and technical training. Whether it’s a Genie Compact or High Reach telehandler, the same training applies to improve productivity in the field. The Genie GTH-2506 compact, GTH-4014 and GTH-4018 high reach telehandlers models are available in Quarter 4 2015.